Albania is liberated by the Partisans during World War 2. After Italy was defeated by the Allies, Germany occupied Albania in September 1943, dropping paratroopers into Tirana before the Albanian guerrillas could take the capital, and the German army soon drove the guerrillas into the hills and to the south. Berlin subsequently announced it would recognize the independence of a neutral Albania and organized an Albanian government, police, and military. Many Balli Kombëtar units collaborated with the Germans against the communists, and several Balli Kombëtar leaders held positions in the German-sponsored regime. The partisans entirely liberated Albania from German occupation on November 29, 1944. The National Liberation Army, which in October 1944 consisted of 70,000 regulars, also took part in the war alongside the antifascist coalition. The Albanian partisans also liberated Kosovo, and assisted Tito’s communist forces in liberating part of Montenegro and southern Bosnia and Herzegovina. By that time, the Soviet Army was also entering neighboring Yugoslavia, and the German Army was evacuating from Greece into Yugoslavia. The papal conclave of 1549–50 starts. The papal conclave from November 29, 1549, to February 7, 1550, convened after the death of Pope Paul III and eventually elected Giovanni Del Monte to the papacy as Pope Julius III. It was the second-longest papal conclave of the 16th century, and the largest papal conclave in history in terms of the number of cardinal electors. The cardinal electors were roughly divided between the factions of Henry II of France, Charles V, Holy Roman Emperor, and Alessandro Farnese, the cardinal-nephew of Paul III. Noted for the extensive interference of European powers, the conclave was to determine whether and on what terms the Council of Trent would reconvene and the fate of the Duchies of Parma and Piacenza. 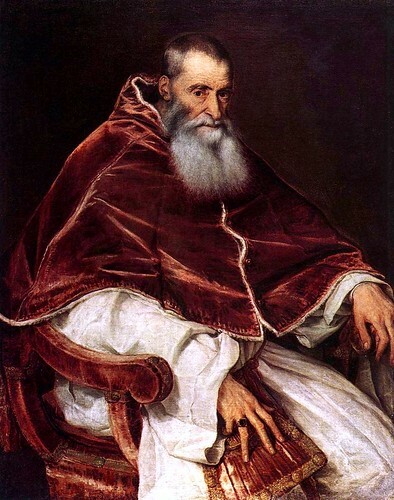 Although the conclave nearly elected Reginald Pole, the late arrival of additional French cardinals pushed the conclave back into deadlock, and eventually Giovanni del Monte was elected Pope Julius III as a compromise candidate. The French hoped that Julius III would be hostile to the interests of the Holy Roman Empire. Nevertheless, tensions between him and the French boiled over when he reconvened the Council of Trent in November 1550, culminating in the threat of schism in August 1551 and the brief War of Parma fought between French troops allied with Ottavio Farnese and a papal-imperial army. French prelates did not attend the 1551–1552 sessions of the Council of Trent and were slow to accept its reforms; because Henry II would not allow any French cardinals to reside in Rome, many missed the election of Pope Marcellus II, arriving in Rome just in time to elect Marcellus II’s successor Pope Paul IV after Marcellus II’s brief reign. The papal conclave of 1549–50 following the the death of Pope Paul III begins. The UN General Assembly approves a plan for the partition of Palestine. The Battle of Fort Cumberland ends with the arrival of British reinforcements during the American Revolutionary War. The My Trach Massacre occurs during the First Indochina War.